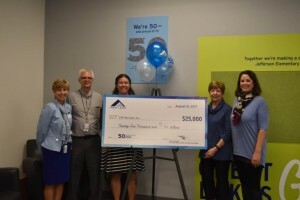 CAP Services and Midstate Independent Living Consultants Each Awarded $25,000 Grant from Great Lakes – CAP Services Inc.
Great Lakes Higher Education Corporation & Affiliates is celebrating its 50th anniversary by awarding grants to nonprofit organizations making a difference in the communities where its nine offices are located. 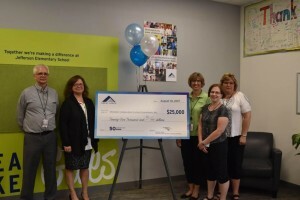 Stevens Point employees today awarded two Brighter Futures Grants, providing CAP Services and Midstate Independent Living Consultants (MILC) with $25,000 each. Brighter Futures Grants are an extension of the philanthropy work done by Great Lakes, which is dedicated to helping more students from low-income households, students of color, and first-generation students get into and through college so they can go on to successful lives and help build strong communities. Employees at Great Lakes’ nine offices across the country were invited to engage in the Brighter Futures grantmaking process, with a broader focus on promoting lasting change in their local communities. A total of $525,000 in Brighter Futures Grants has been awarded to 14 nonprofit organizations based on the funding priorities selected by Great Lakes employees. Mary Patoka (CAP Services) with Neal Tess (Great Lakes), Jane Benzschawel (CAP), Marg Coker-Nelson (CAP’s FCC Advisory Board), Nicole Harrison (CAP). The mission of CAP Services is to transform people and communities to advance social and economic justice. In Portage County, CAP programs address unmet needs of the low-income population. With its $25,000 Brighter Futures Grant, CAP Services will complete accessibility modifications to its new administrative office and continue support services at its Family Crisis Center. Midstate Independent Living Consultants advocates for individuals with disabilities so they can achieve their full potential within communities of their choice. The $25,000 grant will be an investment in infrastructure, including upgrading technology and providing office furniture for new staff members. Headquartered in Madison, Wisconsin, Great Lakes began operating in Stevens Point in 2014 and currently employs 144 area residents. Reinforced by a corporate culture of supporting the community, Great Lakes employees participate in a robust employee giving program called Great Lakes Gives. Through Great Lakes Gives, they contribute to the United Way; take advantage of paid Volunteer Time Off; and provide school supplies, healthy snacks and books for summer reading programs to students at their adopted school, Jefferson Elementary. Brighter Futures Grants are one more way Great Lakes employees are giving back. Since 1967 Great Lakes Higher Education Corporation & Affiliates has been committed to helping students nationwide realize the dream of a college education through our work as a student loan servicer and guarantor, and education philanthropy. We have 2,000 employees at nine offices across the country: Aberdeen, South Dakota; Boscobel, Eau Claire, Madison and Stevens Point, Wisconsin; Eagan, Minnesota; Indianapolis, Indiana; Plano, Texas; and Rocky Hill, Connecticut. For additional information, please visit home.mygreatlakes.org.